ECCC Reparations: A Developing Hat Fashion at the ICTs? 2 hats worn in 2 weeks at the international criminal tribunals? This is more than have been worn since the inception of the first of them, the ICTY, in 1992. Today (Jul, 6) Ratko Mladic has added his touch to this rapidly developing fashion. 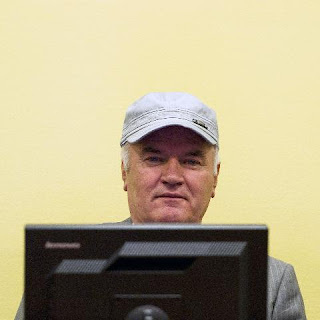 Unlike Noun Chea who goes for the warmth of the ski hat, Mladic is an enthusiast of a hat which looks like a crossbreed between a baseball hat and a JNA (Yugoslav National Army)-issue hat. While there is reasonable doubt of Noun's intentions of wearing his headgear of choice in the courtroom, there is no doubt about Mladic's -- he is snubbing the court.